Bitter foods may not be pleasing to your palate.But the impressive health profile of some kinds of bitter foods might just want you to give them a try.Strangely,bitter foods were considered poisonous and not consumable for long.Until recently medical studies have shown some can offer amazing health boosts ,including prevention and fighting diseases.Read more about the studies here and here. Fortunately for me,bitter wasn't an alienated taste,some like bitter gourd and fenugreek were pleasantly familiar in mom's cooking. * Make the start with more commonly available ,like black coffee,cocoa and extra dark chocolate. * Balance the taste ,pair them with other mildly flavored fruits,nuts and vegetables to balance the unpleasant taste.For instance cooking bitter gourd\melon with onions can help even the bitterness.And Spinach with mustard greens worked perfectly in the ever so popular North India's favorite green side dish. * Use the right cooking method,overcooking might add to the bitterness of the food like coffee and mustard greens. 1.Cook with any of the following bitter foods list(or others you know of).Mention briefly about the health benefits.Can use cocoa or coffee to make lightly sweet desserts or snacks.Remember excess sweetness can mar the health benefits of bitter foods. 2.Please don't send the entries through e-mail.Just leave a link of your blog post(old or latest) under the comments section of this post by March 10th 2010.I'll be glad to include it in the round up.And lastly link back your post to this page. 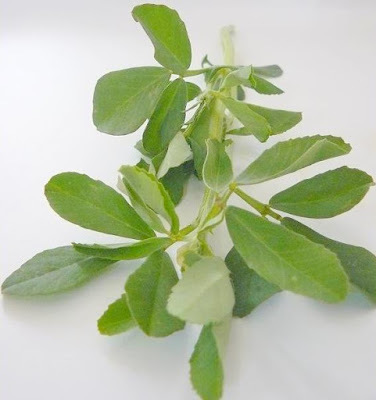 Methi(fenugreek leaves) are fairly common herbs in Indian Cuisine.Lightly bitter,its best in flat bread(parathas) , lentils(dals), Meat(Chicken or lamb) or any stir fried vegetables. Soy nuggets or granules are perfect vegan source of high protein.Nutrela soy nuggets or granules are commonly available in most Indian stores.Although one can also find other brands in health food stores.This recipe is recreation of the one on the Nutrela box.The bitterness of Methi in the cutlets is well balanced by the mild flavored soy,potatoes and lightly sweet carrots and peas.Cooked chicken breast or turkey can also be used instead of soy granules. 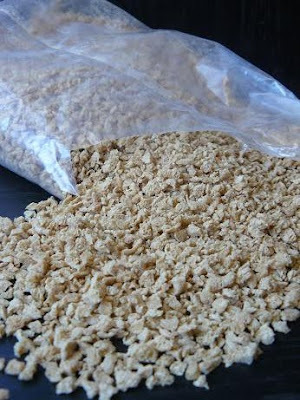 Bring 4 cups of water to a boil,add the soy granules,let cook for 5 minutes. Turn off the heat.Let cool for 10 minutes.Strain the water in a fine colander and rinse under cold water.Then squeeze all of the water from the granules and transfer in to large mixing bowl. Add rest of the vegetables,spices and Methi in ,mix well well to make a even mixture.Take about 2 tablespoon of mixture and shape them round or diamond.Lay on plate.Can be frozen in freezable containers for future use. Heat about a teaspoon of oil at medium heat and lightly roast the 3-4 cutlets at a time ,about 3 minutes each side.Add a teaspoon of oil for each batch of cutlets.Serve warm as snack or appetizer. Wow Yas, wat a fantastic methi soya cutlets..looks incredible!! !Will send my entries for ur next edition of healing foods.. Simple and healthy is the mantra of ur dishes!! Never added methi to cutlets so will try it sometime. I like methi more than karela. 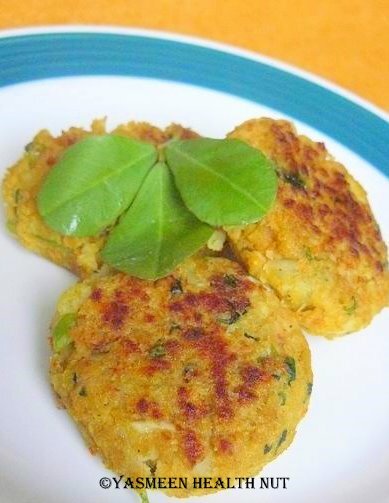 Methi in cutlets is a good one. Will definitely participate in the challenge. Great looking cutlets. Hey, I have something waiting for you at my space.Please check it out. lovely cutlets. Great way of making kids eat methi...They looks so nice and yummy!! We never get fenugreek leaves here. Delicious and healthy cutlets. I can't find any fanugreek either but if I do, I'll definitely give these delicious cutlets a try! I'm not so fond of better foods other than few like cocoa,black coffee and mustard greens.It would be interesting to know more.Thanks for yet another healthy theme. I love bitter foods Yasmeen. My favorites are Bitter gourd fry and Methi chapati. Cutlets looks absolutely tasty and nice click! My mother used to make the best stuffed karelas.Hence we love it as grown ups.Methi of course is also my favorite. wow!!! Those cutlets look amazing. Thank you sssoo much for sharing. This is such a cool challenge and I love all the fabulous info you give. Have a wonderful day! Happy new year.Methi makes everything tasty and fragrant.Perfect cutlets. Yummy cutlets.Not so familiar with fenugreek.Black coffee is only bitter food I consume. This is a fantastic soya cutlets! Simple and healthy at the same time! WOW!! 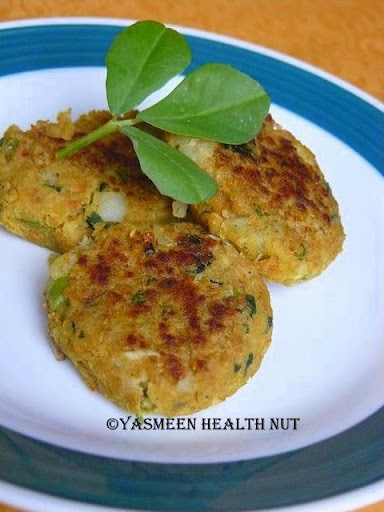 healthy cutlets indeed with the soya and methi leaves..Nice recipe..I will try this next time. And nice challenge...will try to participate for sure. I am learning so much with your posts! Never heard of the soy granules; the cutlets look 5-star to me! By the way, I am not being ungrateful, I just never received the products, or maybe it got lost or stolen while I was gone. Not to worry. my last 3-4 posts were on bitter food! i will surely send u the link. Can i send something with fenugreek leaves also? Would love to send some recipes to your "Bitter Better Event"
Fenugreek(Methi) and Mustard greens (Sarson)are both bitter greens but not the same. Yasmeen, Nice event and that is such an interesting recipe. i love both texturised soy as well as methi greens. "Bitter Better Health" theme is very useful. Here is my recipe: Mullangi Keerai (Radish Greens) Poriyal for this event. Am sending an entry for this bitter better health event..pls do check here.. I have to try your cutlets! Does cranberry count for this bitter foods, as it tastes bitter.. I just happened to find your blog and your challenge. I happen to have a post on bitter gourd, can I enter? Will link it to you. Cutlets look delicious and lovely click too. Stumbled across your blog by accident ,but I really enjoyed your posts and the events you are hosting.Would love to share some recipes for the event here. I have updated the post. Thank you. Hey Yasmeen, Here is another Bitter better health recipe..Let me know if you include this..
Yasmeen, Here are some reposts, let me if it works..for Bitter Better Health Event. stumbled down in to your blog from the other blog, where i read about your event...lovely event and love to participate it your event..
soon i'll be sending my entry...you have a lovely space and nice recipes to try.. I did post it but dint link back but I do promise there will be more entries and shall link with your post!!! Please check out my entry for this event. Hi,I really like your blog.Very healthy and tatsy too. Hi Yas, here comes few more entries here..
Soy vegetable cutlets looks good. HI Yas, here is one more entry for ur event.. Here's the link for my another entry.. If you are going to add photos in the round-up, please let me know, deah! Here is the link for my another entry to your event..
Hope you like them...Thanks for hosting.Will send u more if I can post by deadline..
Hi First time here you have a nice blog. wonderful event. will send mine soon. I am new to blog world. Came to know this event through Divya's Dil Se. My darling, this one is a winner. Second time making the cutlets and they are delish! Ok not exactly like yours. I soak soy chunks in hot water for about half hour, saute them in peanut oil then mix with potato and other veggies. I do not know where to find fenugreek here. All the same the outcome is very good. An amazing lunch box item for me and the kids. Thank you for sharing!! looks yummy to me..can't wait to try!! looks yummy! can't wait to try!